Eight Nights tells the story of the lives that inhabit an apartment from 1949 to 2016. Rebecca, a young Holocaust survivor and refugee, is finally free to start anew in the United States, as she confronts the past that haunts her, alongside her father, husband, friends, daughter and granddaughter. The play takes place over the eight nights of Chanukah, spanning eight decades of Rebecca’s life, gracefully weaving together heart-aching moments with dark yet life-affirming humor. The story touches upon not only the story of Jewish Holocaust survivors, but also the global refugee experience, and acknowledges the trauma mirrored in the African-American community, with interned Japanese citizens and the current Syrian crisis. Directed by Adam Immerwahr, Artistic Director of Theater J, and produced in collaboration with Wayne Firestone, founder of Plays2Gather. 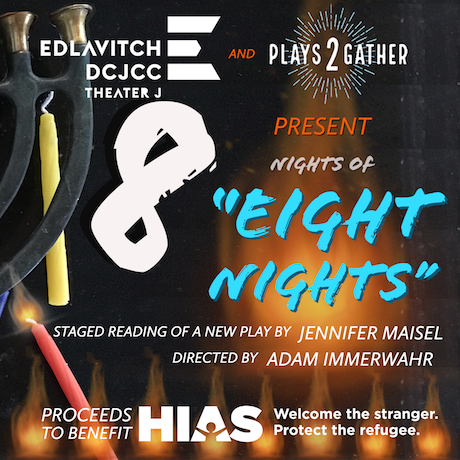 “8 Nights of Eight Nights” is a series of staged readings of Eight Nights, a new play by Jennifer Maisel, on eight different nights in eight different cities, to raise funds and awareness for HIAS in the wake of the Tree of Life shooting in Pittsburgh, and to stand with all those who are persecuted on the basis of race or religion the world over.